Are you traveling to celebrate Thanksgiving? If the answer is “yes,” AAA estimates that you will be among 42.5 million Americans traveling 50+ miles during the holiday weekend. What’s more, 99% of us will be driving! As you begin your holiday journey, please stay alert and take precautions to ensure that you have a safe and happy holiday weekend. Meet Tennessee’s Insurance Person of the Year! Congratulations to OneBeacon Technology’s Senior Underwriter Paige Stiefel, who was honored as Tennessee Insurance Professional of the Year at the Tennessee Council of Insurance Professionals state meeting. Paige currently serves as president of the Nashville Insurance Professionals, Inc. and is also the Southeast representative for the Young Professionals of IAIP. No stranger to the honors circle, Paige was also named Nashville Insurance Professional of the Year by the Nashville, Tenn. Insurance Professionals and the International Association of Insurance Professionals, Inc. (IAIP) earlier this year. Way to go, Paige! 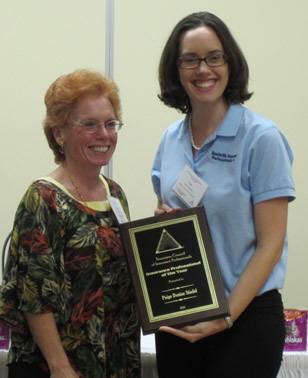 Angie Palko (Willis) presents Paige Stiefel with the 2011 Insurance Professional of the Year Award. Hello. The OneBeacon Professional Insurance office in Farmington has been without power this week. Due to the magnitude of the October storm, we still do not have a timeframe for when it will be returning. We have set up remote offices and will continue to find ways to respond as quickly as possible to any calls or emails. We are also aware that those of you who are trying to contact our offices via phone may from time to time receive a busy signal. This is a direct result of the power outage, and not an indication that the line is in use. If you need immediate attention, please call our national toll-free line at 877-861-8989, followed by the four digit number of the person you wish to contact. You can also call the OBPI general information number at 877-488-OBPI for an immediate response. If your call is extremely urgent, please contact OBPI President Paul Romano at 860-798-5655 and he will ensure your call gets sent to the right OBPI contact. As we continue to look for ways to effectively service our customers during this situation, we appreciate your patience. We look forward to being fully operational shortly, and will keep you posted as to our progress.